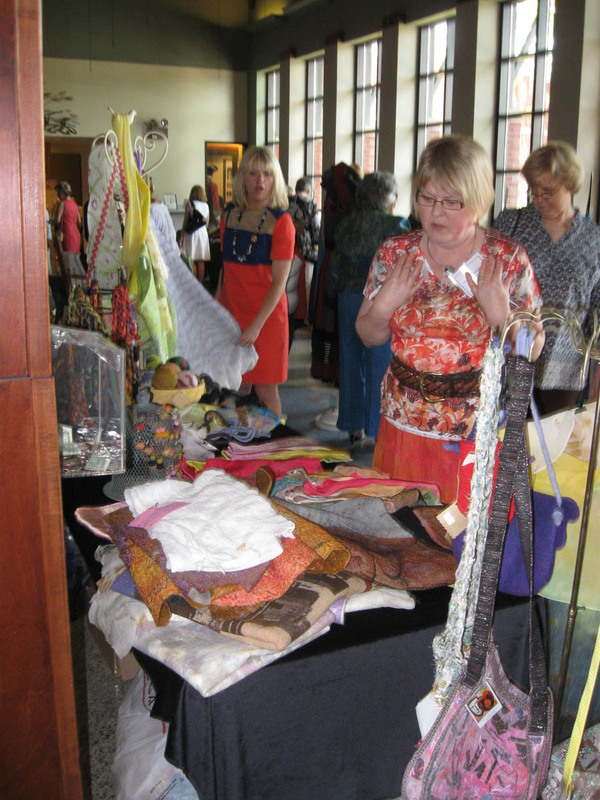 A group of my quilt guild friends and I attended The Magic of Wearables fashion show and luncheon at the Museum Center at 5 Points in Cleveland, Tennessee this weekend. 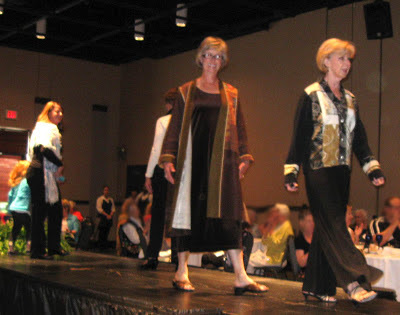 This show is the revitalization of the former Tennessee Presents Textiles runway show that was conceived and directed by my good friend and fiber artist, Geri Forkner. Geri provided oversite and vision for the show and another fiber arts friend of mine, Karen Viser, headed the committee to successfully implement the revival of this wearable art event. Kudos to Karen, Geri and their team! Several accomplished fiber artists from the southeast had their artwear modeled in the fashion show that was emceed by Libby Callaway, former fashion editor at the New York Post. Among the felted and hand-woven garments were works by Liz Spear, Neal Howard, Geri Forkner and Tone Haugen-Cogburn. The runway pieces and other hand-dyed, stitched and embellished garments and accessories were available for purchase from the artists before and after the runway presentation. Other vendors had hand-dyed yarns and fibers for sale as well. Geri Forkner (left) with her nuno-felted and hand woven art pieces. Here are some of Karen Viser's custom garments at her booth. Karen and I attended studio intensive art workshops together. 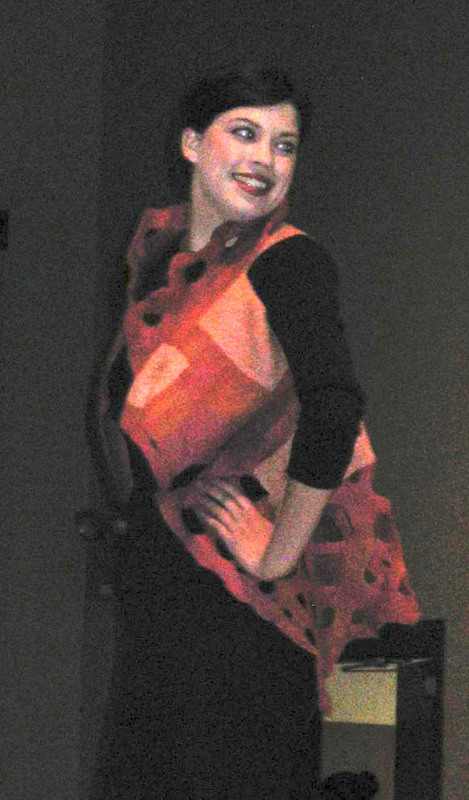 It was wonderful to see the heights to which she has taken various surface design techniques and incorporated them in her hand-dyed silk and velvet custom sewn vests. 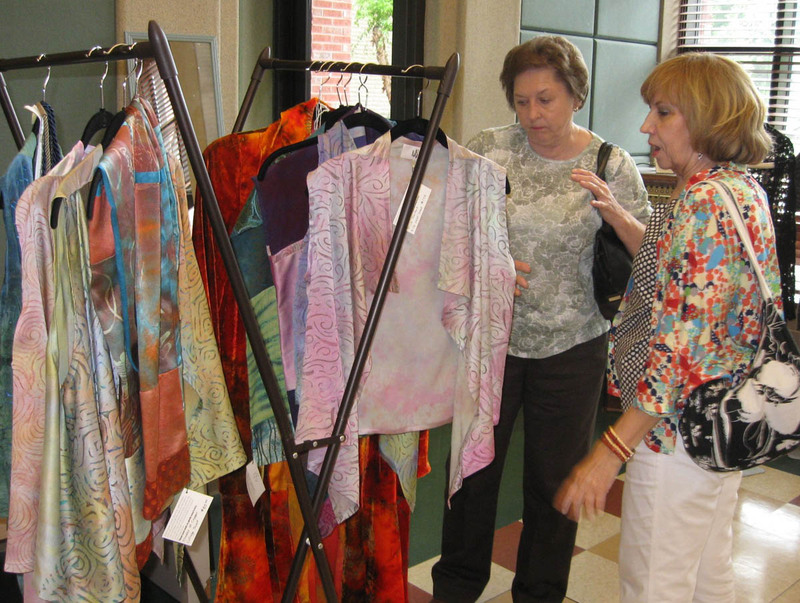 Shoppers admiring Karen Viser's hand-dyed and surface embellished garments. Tone Haugen-Cogburn is a multi-disciplined fiber artist. She is a long-time quilt artist who has taken to felt-making the past few years. Our paths often cross at fiber art events such as these or at quilt shows and other quilting events. It was great to see Tone again. 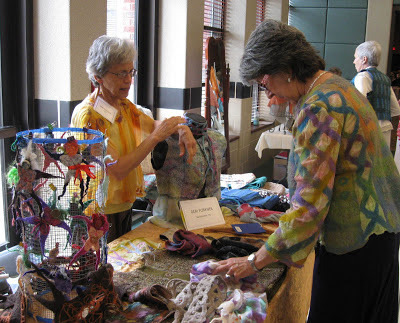 It was a great day to share with friends—introducing first-timers to a fiber art wearables show such as this, and visiting with other fiber art friends and seeing their latest fiber art creations! I had a grand time - thanks for inviting me! It was a great show. Glad you could join me, Cristy!